doogiePIM is powered by your imagination. 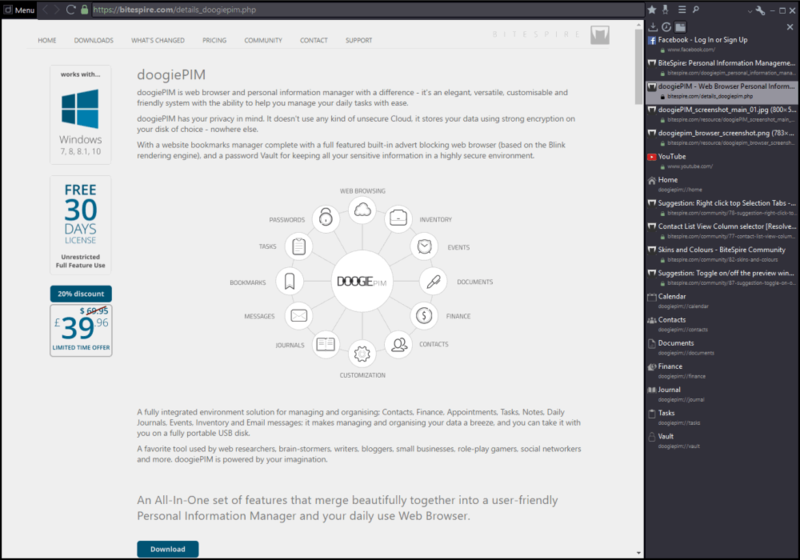 doogiePIM is a web browser and personal information manager with a difference - it's an elegant, versatile, customisable and friendly system with the ability to help you manage your daily tasks with ease. doogiePIM has your privacy in mind. It doesn't use any kind of unsecure Cloud, it stores your data using strong encryption on your disk of choice - nowhere else. With a website bookmarks manager complete with a full featured built-in advert blocking web browser (based on the Blink rendering engine), and a password Vault for keeping all your sensitive information in a highly secure environment. A fully integrated environment solution for managing and organising; Contacts, Finance, Appointments, Tasks, Notes, Daily Journals, Events, Inventory and Email messages; it makes managing and organising your data a breeze, and you can take it with you on a fully portable USB disk. A favorite tool used by web researchers, brain-stormers, writers, bloggers, small businesses, role-play gamers, social networkers and more. doogiePIM is powered by your imagination. An All-In-One set of features that merge beautifully together into a user-friendly Personal Information Manager and your daily use Web Browser. No limitations. 30 days free licence. This page was last modified on 5 October 2018, at 04:07.